Having started in 1971 as McConnell Repair Service, we began from a service shop that repaired broken and damaged farm equipment. In 1973 McConnell Repair Service became McConnell Farm Supply, and moved to the current location in Rosebush, Michigan. By the late 1970’s McConnell Farm Supply was in addition to operating a service repair shop, selling and servicing new and used farm equipment. A few of the first lines of equipment that were carried were Owatonna loaders and hay equipment and Mustang skid loaders. In the early 1980’s an addition was added to the facility as more lines of equipment were also added. A few of the equipment lines added during the 1980’s were Gehl and Knight Manufacturing, now known as Kuhn North America, of which we are now the largest dealer in the state of Michigan. Adding office and administration space in the early 1990’s, McConnell Farm Supply also incorporated, and became McConnell Farm Supply, Inc. Beginning in the late 1980’s and into the 1990’s we became very involved in TMR mixers and manure spreaders which was the beginning of the main focus of what the business is today. In the early 2000’s an addition was added for a new service shop facility, and part of the existing structure was converted to the current parts area. In the last ten years the operation has grown to be a leading supplier of equipment and support services in the dairy industry. As we have in the past forty-three years, we are looking forward to the next forty-three years of making your business our business. 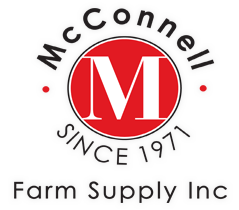 McConnell Farm Supply, Inc. provides equipment, parts, and service support. Activities are heavily concentrated on meeting the needs of dairymen and the beef and cattle producers of today. Feed mixing and manure handling equipment are the main focus of operations at McConnell Farm Supply. We also serve cash crop farmers, hobby farmers, construction and building tradesmen, as well as the residential customer with a country living lifestyle. We sell new and used equipment, and service what we sell. We also offer hay making equipment, skid steer loaders, and extendable boom loaders, as well as a variety of attachments for these units. We offer a large selection of support products such as gates and round bale feeders. We also offer zero-turn mowers for large scale mowing projects and commercial use, as well as a selection of small three point attachments. We have a large stocked parts department, and ship out on a daily basis. We are open six days a week, and have a twenty-four hour answering service for emergencies. The staff at McConnell Farm Supply is committed to your continued success. Years of experience are what you can expect when doing business with us. Jim McConnell started McConnell Farm Supply in 1971, and with a few ideas, a lot of hard work, and most of all valued customers, the business is now approaching its 44th year. Under Jim’s direction the team at McConnell Farm Supply offers superior support for today’s farmer. We have personnel that have been involved in the agricultural arena their entire lives and that understand the importance of maintaining a consistent and knowledgeable support system. Our key personnel offer years of experience, in specific areas such as, TMR mixers, manure spreaders, and scale systems. Our staff understands that a product is only as good as the support that can be provided for that product. You can expect that when you make the decision to trust us with your business, we then assume the responsibility to be here in the future to take care of your needs. We operate under the philosophy to treat our customers the way we would like to be treated. The team at McConnell Farm Supply would like to thank all of its customers for the past forty-three years and looks forward to another forty-three years of service and support.